Today's post is from Josh Murdock, Instructional Designer in the Office of Information Technology at Valencia College, Florida. Professor Josh has given us permission to share this blog post with you. For more information, see ProfessorJosh.com. Don't miss his webinar on Wednesday, June 5 at 2:00 PM EDT—Engaging Diverse Learning Styles with Web and Mobile Multimedia Tools that Add PIZZAZZ to SoftChalk Content. We look forward to seeing you at the webinar! Almost everyone has heard of the famous “Gangnam Style” video that, since its release in July 2012, is the most viewed and liked video on YouTube. Now I’ve been pondering how this type of engagement would be great to recreate in e-learning. What does Gangman Style mean? Gangnam style refers to the style of the people living in the Gangnam District of Seoul (much like Beverly Hills). In this area of Korea, there are many people who are considered posers and wannabes, and the “Gangnam Style” video is poking fun at these people trying to be something that they are not. The song lyrics explain the characteristics of the type of girl that Psy (the Korean artist in the video) wants – a classy girl who is modest during the day, but knows how to have fun at night. Ready to put a little “Gangnam Style” into your e-learning? Here’s how. “Gangnam Style” has lots of different locations in the video. While it might be hard to get that many different scene changes for a course, it is important to keep a course fresh and a little surprising. Don’t bore students with the same setting throughout the course. Change it up – surprise them, keep them wondering what is going they will learn next. Remember, it’s OK to be random; as long as it stays within the course objectives! Humor is a great tool to engage and entertain in any venue. Who doesn’t love to laugh? Mixing awkward humor (like the part in “Gangnam style” when Psy tries to lay on a man’s shoulder in the sauna) with just-plain-funny humor (like the little Korean kid dancing like Michael Jackson) is a great method to keep people curious and entertained. Make sure to implement a little awkward and just-plain-funny humor into your course for students to get a laugh. Think about how you can develop humor into an section introduction. Knowing when and where to place call to action links is important. The natural way a person native to the English language will look at something is from left to right. Makes sense right – it’s the way English is written. The most valuable link should be both at the beginning of a presentation in the top left corner, and at the end of a presentation on the top right corner. “Gangnam Style” places their call to action links accordingly. The first link is a direct link to download their song on iTunes. This is paired with a link below it on the right side to subscribe to their channel. The end of the video (before the extras) has two subscription links on the top right side. After the extras they again have their most important call to action link in the top right corner, to download their song. Think about what is the most important call to action for your course’s presentation? Is it the objectives you want them to complete? Is it the project they will be working on in that section? Keep it simple and to the point. Use keywords that are already popular with students to easily understand an area (“Gangnam Style” used Psy in the title because he is already a great Korean Pop artist, driving them more traffic). In the description, link to areas where students can find out more about the topics and what it offers. Link to an educational website, a Wikipedia page, and videos on the same topic, etc. Make sure to give students enough information so they don’t have to go looking elsewhere for additional materials. Make the description a one-stop-shop for all the info they are looking for related to the topic being discussed. 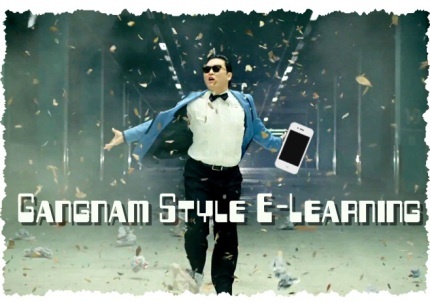 Ready to add a little Gangnam Style in your E-Learning? “Gangnam Style” is such a revolutionary video because it puts humor and fun into a portrayal of Korea, a country that is usually characterized as being professional, hard-working, and talented. Psy is basically making fun of himself, and this is the element of the video that makes it so compelling. Many times e-learning courses are taken too seriously! All they need is a little “Gangnam Style” to spice them up and make them come to life. Register today for Josh Murdock's webinar on Wednesday, June 5 at 2:00 PM EDT. Engaging Diverse Learning Styles with Web and Mobile Multimedia Tools that Add PIZZAZZ to SoftChalk Content.